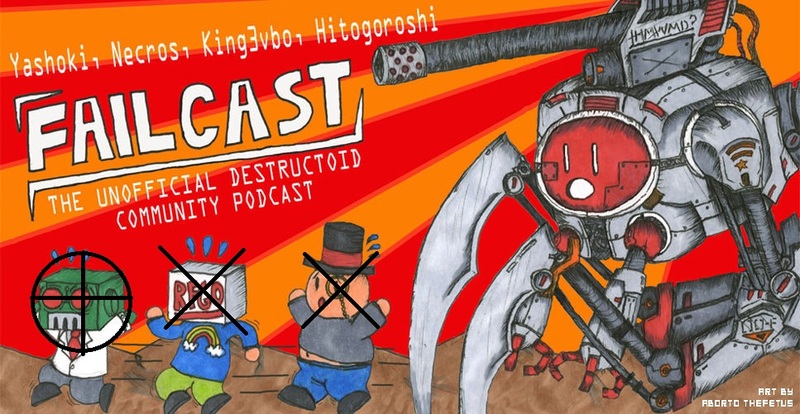 As you may know, Failcast releases a new episode every other Thursday. We just don't have the resources to produce a new episode every week right now. At the same time, we realize that after a couple of warm-up episodes, you may be starting to develop a healthy addiction to the show. You've told your friends and family that you "can quit any time you want to," even though you have no intention of quitting. In rare cases, you may already be showing signs of withdrawal; lightly shaking the controller may be a sign that you're hooked (unless it's the Wii.) If any of this is true, then consider what we're about to share with you a temporary relief from your hallucinogenic nightmares. Between full episodes of Failcast, the Fail Team will be releasing short preview episodes to give you an idea of what to expect on the next show. These are not intended to be full shows and probably won't even have the full cast. However, this is where we will introduce our community guest for the coming week and inform you of why you should give a damn about what they have to say. This week the dubious honor goes to NihonTiger, who confuses Charlie and Necros with his demonic last name. Also, we think someone died. We might have brought that up. Needless to say, God help those of you with addictive personalities once episode one is released next week. Click here to download for your MP3 player of choice. As always, we want to know what you, the Dtoid faithful, think of the show. If you think this is a terrible idea, let us know, and we promise to take out our anger in constructive ways. Send us your praises, complaints, and pictures of spider-on-girl action to [email protected], and we promise not to sell your email for a hundredth of a cent.